We love hiking Spring, Summer, or Fall! This picture was taken on the Temple Quarry Hike. Did you know that more than 1000 people read our Favorite Hikes post in the first week? We featured hikes across the Wasatch Front like Hidden Falls, Ghost Falls, Grotto Trail, Silver Lake, Battlecreek Falls, Rocky Mouth Falls, Buffalo Peak, and Stairs Gulch. It seems like a lot of readers are ready to get a jump start on the hiking season (and who wouldn't with temperatures pushing toward 90 degrees!). For this reason, we felt that it was time for a new post. We do have one request, though. If you know of an appropriate hike for our kids (under 5 miles as they're pretty small), please leave us a comment so we can check it out and add it to our Hiking tab. Thanks! Donut Falls: This 1.5 mile (round trip) hike is located up Big Cottonwood Canyon. It's an easy hike to a waterfall that is admittedly less impressive than it was before the rocks shifted. Still, this is a very popular hike close to Salt Lake City that is easy for kids of any age. Cecret Lake: This hike is for a little more adventurous hikers. Located at the top of Little Cottonwood Canyon, the Cecret Lake hike winds through beautiful mountain meadows and ends at a gorgeous lake. The hike is rocky and steeper than many of our simpler hikes, but we saw a lot of wildlife, and enjoyed the hike along the way as much as the destination. Cascade Springs: Cascade Springs is a short boardwalk (mostly) over an aquatic spring in which you can see fish and other animals. Even the youngest hiker can enjoy this walk, though keep them close as there is no railing. This hike is located at the top of American Fork Canyon. Bridal Veil Falls: In Provo Canyon, a short walk takes you to Bridal Veil Falls. Completely stroller or wheelchair accessible, you can feed the fish for a quarter or play in the pool at the bottom of the falls. This waterfall is considered one of the most spectacular in the western United States! Temple Quarry Walk: The short walk around the Temple Quarry has interpretive signs that help you understand information about how the Pioneers built the Salt Lake Temple. More of an outdoor museum than a hike, this walk is at the mouth of Little Cottonwood Canyon. Lisa Falls: We like this hike because it is very short and leads to a unique waterfall with the water flowing sideways down the rock. Make a double adventure out of this one by pairing it with the Temple Quarry. Red Fleet State Park: You have to be in the Uintah Basin to do this one, but it must be included as one of our favorites! The destination is a large (100' x 100'?) slab of sandstone with over 200 dinosaur tracks. The hike winds through a beautiful desert area. This hike is located just north of Vernal. I have enjoyed Big Springs Hollow hike in Provo Canyon. It might be bordering on 5 miles but it is a fairly easy hike and beautiful scenery. Its fairly popular I think. We did Big Springs this past weekend with kids 10, 8, 4, and 11 month old baby in a jogging stroller on the horse trail (it runs parallel to the walking trail). We LOVED it! Thanks! I am not familiar with either Big Springs Hollow or Nobletts! 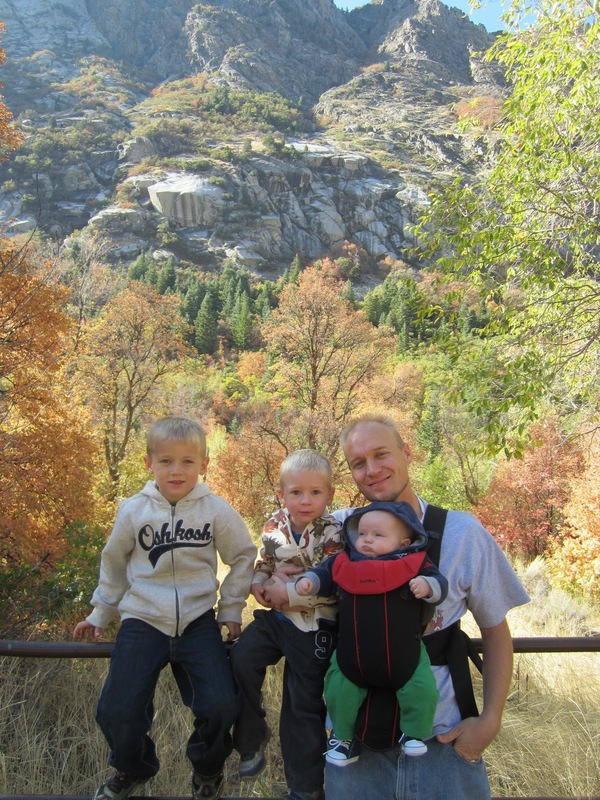 Look for these hikes to appear this summer on Utah Valley Family Adventures! We just bought the book 60 Hikes Within 60 Miles: Salt Lake City. Can't wait till the kids are out of school so we can hit the trails again! LocalHikes.com is also a great resource. There are so many trails in Utah. We could hike every weekend for years and never repeat! How fun is that? We love that book 60 hikes within 60 miles of SLC, too! Thanks for sharing about your favorite hikes. Just an fyi about the Nobletts link above. We followed the directions on that site and they are just a tad off, enough to confuse us! Follow the same directions but drive until mile marker 12 and THEN look for the lot on the left. It is very obvious with signs, but if you only drive to mile marker 11, there is a small circular lot on the right which has no signs, but has a trail leading from it. We decided to keep driving to make sure, but we were thrown at first. Just an fyi on the directions for Nobletts on the website link given in the above comment. Follow the directions as given, but drive until you hit mile marker 12 and THEN look for the lot on the left. If you go to mile marker 11, there is a circular lot with no signs that threw us for a moment. The Nobletts lot is very obvious, it is large and has signs, but you may be thrown if you are following the 11 mile marker directions.